These types of trips are designed for someone looking for a really adventurous cycling holiday. We use professional bikes to meet your needs. For each trip, we would ask you to send us your height and we will prepare the suitable bike for you. We have designed our tour itineraries for people who practice cycling often and want to do both sightseeing and have physical challenges. Every day, you will cycle from 30 to at most 80 km. It depends if you are on good roads or bumpy ones. We always try our best to avoid the crowded roads and using back roads as often as we can. This is a real balance between touring and cycling. 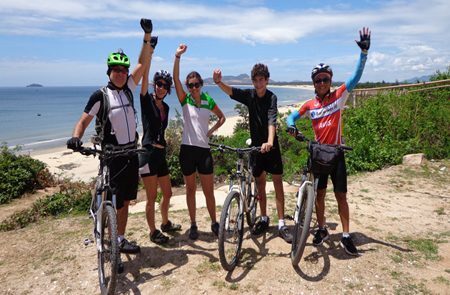 For each adventure cycling tour, we have well-prepared support crews and equipment including van, truck, professional mechanic, tour guides; we also have spare bikes, spare tubes, and tools. For each trip, we support enough drinking water, fruits and foods for your needs during this physical trip. However, this is an adventure holiday, not a racing tour, so we will design the trip to balance between adventure, relaxation, and fun in the safest way. 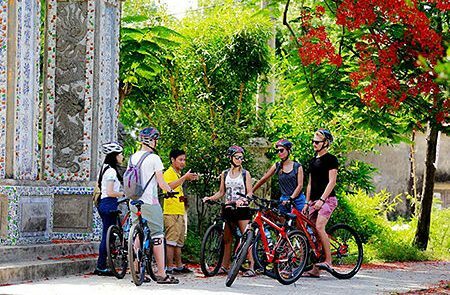 Travel from one place to new destinations, we take soft cycling tours in Vietnam to visit cultural and historical sites using bicycles instead of vehicles, which allows us to go further out of noisy and touristy places to peaceful and lush country sites and villages. 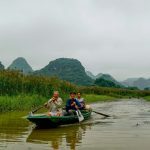 Just need to pick up a good Vietnamese bicycle at your hotel or homestay and spend a couple hours in the afternoon gently paddling on flat lanes to neighboring villages cross rice paddy and back to the hotel or homestay by another way. Our soft cycling Mekong Delta tour starts from Ho Chi Minh with a drive to My Tho where we can visit biggest Vinh Trang pagoda and then take the boat to Ben Tre for softly bike along the lanes of villages passing fruit gardens and have a night at Vinh Long home-stay. 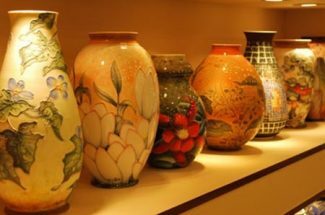 Vietnam is famous for its diverse nature. From vast rice paddies to stunning sandy beaches to spectacular mountains, its beauty mesmerizes travelers at the first time. Vietnam also well-known for many ideal places for the biking adventure. Here is top 10 best place for cycling in Vietnam we recommended. Sapa is a foggy town belonging to the mountainous northern area of Vietnam. This land enchants tourists by heavenly beauty with hovering soft clouds scarfing mountain ranges. Along the biking route, travelers will see the change in nature going up to higher altitude and encounter many minority people in treacherous paths. Rice paddies are considered as the specialty of this town which turn to a prosperous yellow in during harvesting. Know as the hometown of the best tea in Vietnam, Moc Chau is a small peaceful town of Son La province in Northen Vietnam. Thanks to its immense green tea plantation, heavenly atmosphere with vivid wildflowers and spectacular mountains, Moc Chau is one of the most beautiful places for cycling in Vietnam cyclers cannot miss. Hai Van Pass should be on adventurous cyclers’ list because it posses spectacular mountains and sharp cliffs against the ocean. 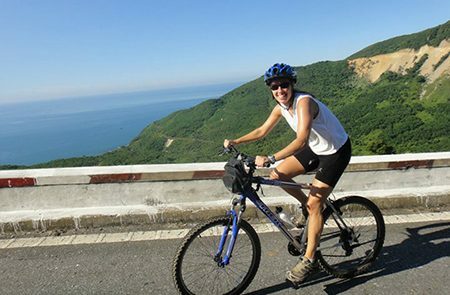 There are many ways to do cycling on Hai Van Pass: you can ride from Hue and head to Danang by passing Hai Van. The wonderful natural beauty will mesmerize travelers along the route. 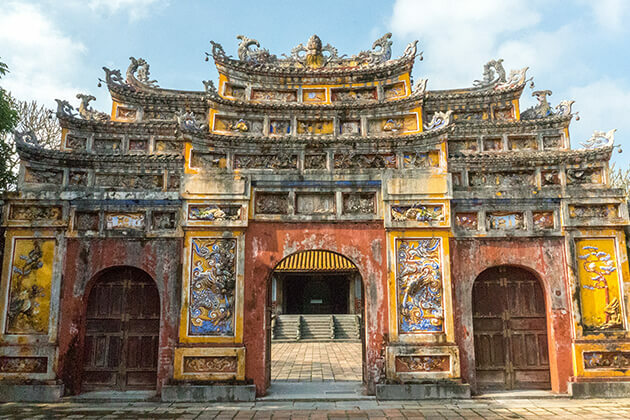 If you are looking for a relaxing cycling trip, Hoi An is a promising place for you. 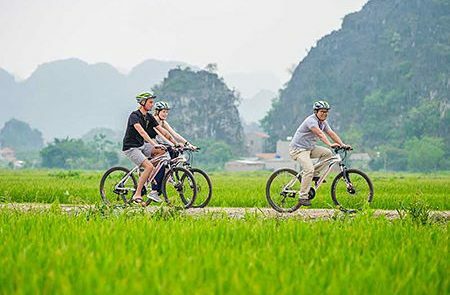 Cycling from the bustling city to peaceful rural areas, you do not only enjoy a beautiful sightseeing but also experience Vietnamese lifestyle and taste a ton of traditional dishes. You will easily encounter many iconic images of Vietnam such as rice paddies, bamboo house, water buffalo, etc. 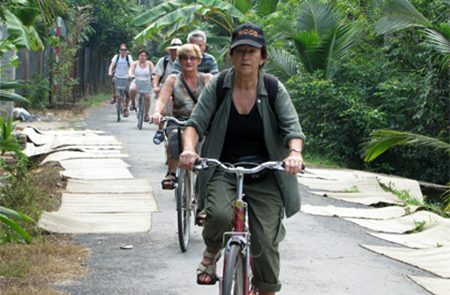 Cycling in Hoi An is the best way to find the poetic of this prosperous town. Located on the Langbian Plateau of Central Highlands of Vietnam, Da Lat is known as the city of love with many vivid fields full of wide flowers. Coming there cyclers can ride any route they want but the route often chosen is riding to the base of Langbian Mountain and continue going along the forest trails and heading to Victory Lake and Valley of Love. Along the route, you can enjoy the beauty of spectacular mountains and silver waterfalls. What is special about Cham Island is the wide ranges of experience you can get cycling around this beautiful Island. Cyclers will be mesmerized by amazing rich biodiversity along the journey. There are many routes you can choose such as you can ride along the coast after that cycling deeper into the island to explore the lifestyle of fishing villages there. Mekong Delta is the greatest place for cycling with wonderful natural beauty and super friendly locals. Visit this land to appreciate rice paddies expanding to the horizon and colorful floating fruits on the rivers. People here built their houses beside a dense network of rivers, canals, and streams, some live on their boats. Cyclers also can go to quaint riverside towns to learn about the locals’ lifestyle. The time between October and February is the best time for cycling in Vietnam because the weather is cool and rarely rain. You should avoid summer months when the temperature can reach over 40°C. If you do a cycle trip in summer you should get up early and stop by a coffee shop or street-side restaurant to take a nap at noon and avoid the heat. The big highway which connects north and south Vietnam is considered as one of the worst places to cycle in Vietnam because of the highest number of trucks and busses. While the Mekong Delta is one of the best choices for cycles with hundreds of small roads you can turn off to and get off the beaten track. Traffic there is less intense and people are super hospitable. You can find easily an accommodation along the road with a reasonable price. There is a wide range of hotels with different price fluctuating around 10 dollars for a simple room. 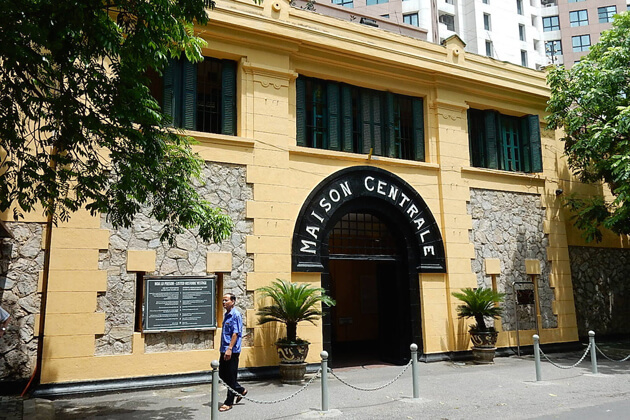 The most popular type of hotel in Vietnam is a narrow 3 story with reception area on the ground floor. Every hotel has a space to park cycle overnight. Vietnamese cuisine is so tasty you can find cheap foods everywhere along your route. Banh Mi is available along the street and is one of the best choices for breakfast. There are a lot of options for lunch such as Bun, Pho(beef or chicken noodle soup with vegetables), etc. The price of a bowl of Pho is around $1. During the journey you can meet many Vietnamese people, some of them can wave their hands and say “hello” to you. 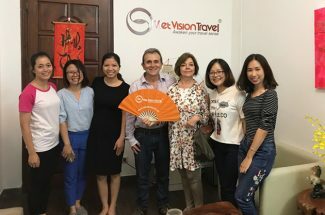 The simplest way to respond is saying “ hello” with a smile, but if you can say some Vietnamese sentences like “Xin chào” or “ Cảm ơn” that ‘s much greater. In case you want to ask someone direction you should use the phrases “ ở đâu”, it sounds like “o dough”. But the best way to find direction is writing it down because it is quite hard for foreigners to pronounce Vietnamese, or using Google map. Cycling in Vietnam you may have to be faced with some problems such as being ripped off, being lost, etc. If you are lost you can ask locals for help, if you lost your bike you can take an independent mini-bus, which serve as the town to town transport in most of the country. Many cyclers may be ripped off when buying something, so the solution is that once you have a sense of how much things should cost, you can bargain for a reasonable price. 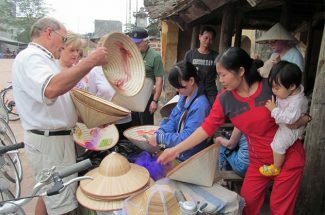 We operate a variety of Vietnam vacations and tours. 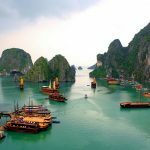 Check out our recommended Vietnam cycling tour, if you do not find any suitable tours or day trips, please contact our experts. We will help you tailor a unique cycling tour that is exclusively for you.